We here at MALT HQ have received the fruits of our labours: The Whisky Exchange sent us advance samples of whisky. MHQ was the scene of a long and arduous discussion debate wrestling match duel fight chat and decided that Mark would take the Japanese whiskies while I’d take the Elements of Islay. A word about Islay: When I die, I would like to be buried in peat to be consumed and turned into Islay whisky. I quite honestly love all the whiskies, but there’s something raw and rugged and beautiful about this southern Hebridean island, and the drams that come from there. I even love, without reservations Caol Ila. It’s a fine dram of outstanding value, and not to be sniffed at, despite its owners antics. 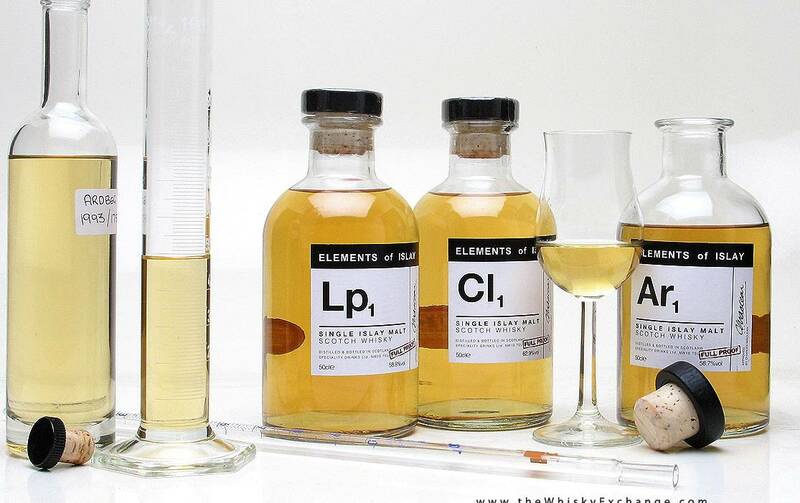 Here’s the scenario for the Elements of Islay: Experiment with what we mean by whisky. Dig deep into the cellars of Islay distilleries and marry up some cask strength monsters from between 5 and 20 casks, place them on periodic tables – these are more or less what the whisky you know and love is made of. Put them in some clever packaging, noting a pharmaceutical sensibility, and bottle at 500ml. Search for a specific expression of each distillery and area, and hopefully make some lovely drams on the way. Give them coded names. Ardbeg’s first will be Ar1. Bruichladdich’s first will be Br1, et cetera. Don’t tell anyone the age. These are meant to be elemental Islay whiskies. Today, we’re tasting Bw1, Br4, and Pl1. We started off with this gem from Bowmore. Bottled at 52.9%, and with nothing to hint. In the glass, we find pale gold – almost spun gold. On the nose, we get hints of peat and a lovely promise of warmth, along with notes of not-unpleasant sweat. All three of these, at cask strength, invite the addition of a drop of water, but it’s easy to go overboard. This dram opens up into notes of seaweed and peat over a sweet core; this isn’t a terribly deep dram, with a short finish leaving a hint of salt in the mouth and a subtle smoke aftertaste. It’s a unique set of flavours, but also, in a way, what you’d expect from Bowmore. £55 for a 500ml bottle. Second up – Bruichladdich’s fourth element in the series, at 54.7%. I was excited to try out this pale straw-coloured whisky because of its provenance. Bruichladdich has never sent me wrong yet, and I’m happy to try them out. There are hints of sugarcane on the nose — almost like a rather decent 3 year rum, with caramel and ginger and the promise of spice. When we get the Br4 to the mouth, it rolls around with a lovely, sweet slippery feel, filled with spice – chilli and ginger, almost stinging, with spring grass under a hint of iodine and pepper. This is a pleasant, not massively deep or complex dram, but a mystery – like much of Bruichladdich’s offerings. Finally, there’s a really lovely dark dram towards the end. What on earth, the clever of you might ask, could Pl1 be? There’s a bit of cheating going on here – this is technically a Bruichladdich malt laid out under the Port Charlotte brand. Bruichladdich bought and is redeveloping the Port Charlotte distillery, but it won’t be open for a while yet – and we certainly won’t be seeing whisky from it for some time. Bruichladdich is, however, making whisky under the Port Charlotte name – limited editions evoking what they think is early 19th century whisky styles. If this is an example, we’d like to drink more. In the glass is a thick, amber-coloured honey, 60% alcohol. On the nose we find overwhelming notes of peat. My lovely partner referred to it as a blue nose. There’s a hint of a not-unpleasant wet dog scent – the nice bits of a wet dog. The addition of just enough water opens it up just a bit, and we start to get hints of cured, toasted tobacco and fig. When you put this dram in the mouth, though, this is when you discover deep, complex, strong notes of iron and iodine, with grass and fresh-cut hay underneath a layer of thick, assertive Islay peat. This is a dram that you want to hold in your mouth and let the dream dissolve, leaving behind a smokey licorice flavour. This is a dram that keeps on giving. £65 for a 500ml bottle. I’m thrilled to see innovation in whisky production and distribution — there are a thousand niche markets to fill, and there’s loads of lovely whisky sitting in casks. Let us at it, and we’ll be the happier for it. International travelling man of mystery, and person who is most likely to find a duty free bargain. There aren’t that many whisky websites or blogs that I drop by now and again. Whisky Intelligence remains the source for news as do a..